Last year we programmed over 600 national and international classical, popular, and contemporary concerts and events, reaching over 600,000 people, and engaged over 18,000 people through our Education & Community programme. We believe that music is essential to everyone’s life and it has the power to transform and change lives, to entertain and uplift, to create shared experiences, and to educate. As a registered charity, to achieve our goals, financial assistance from individuals, Trusts and Foundations, and from corporate sponsors is vital. I oversee the work of the Development team, and am also responsible for sponsorship, business partnerships, advertising, major donors and some trusts and foundations. It’s fantastic working with a really great team of staff! I am the Development Assistant and responsible for day to day admin including, amongst other things, processing donations, organising corporate and in-house events and managing regular gifts. I’ve worked for THSH for 22 years and have seen lots of exciting changes since I joined in 1990! My role here is to look after the administration of the Membership scheme and Friends of THSH. I enjoy putting together creative and interactive events where our Friends can get closer to our staff, the artists and our incredible venues. I work closely with the other Members of my team on specific campaigns where individuals play a vital role in raising much-needed funds towards Education and Community projects. I’m the Development Manager for Trusts & Foundations so I spend a lot of time working with our internal teams to put together funding applications for a whole variety of projects. 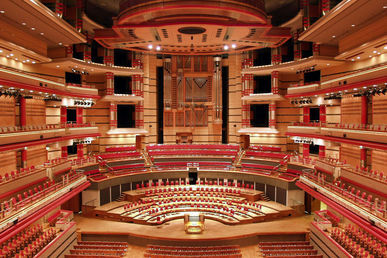 In the last year I’ve been lucky enough to work on projects ranging from Arts Awards for young people in Birmingham, to a new humidification system for the organ at Town Hall (which I never even imagined I’d learn about before coming to work here! ).